Craft Magazine puts on quite a show at it's annual Maker Faire. I have spent a few years working in the Swap-O-Rama-Rama event where you assist other crafty fair-goers in reconstructing used garments into hip new treasures. 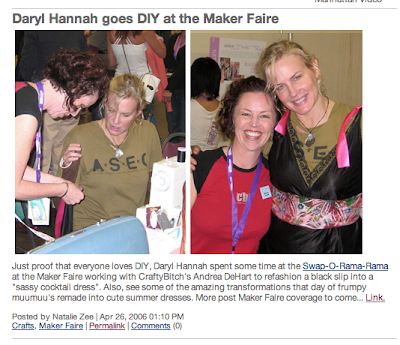 Daryl Hannah was on hand at this particular show and asked me to assist her in transforming a slip into a funky top. I managed to settle my nerves and not prick her with pins. She jumped on my sewing machine and completed the project in record speed. She was a great sport!